Is there a Korean equivalent to the verb “to google”? Google search engine being dominant, the verb "to google" is commonly used to mean "to search using Google", or more generally "to search on Internet". Is there a Korean equivalent fo this verb in Korean? Funnily, I could not find the answer using Google... the only thing I could find is that there is a 구글링 (Googling) entry on the Korean Wikipedia. I cannot fully understand it but it seems to be on the Western use. I am not sure if it says it is common in Korea or if a verb (구글하다 maybe?) exists. It's a common thing in English to verb (I mean ‘verb’ as a verb.) nouns, no matter whether they can be actually done or not. For example, grenade is not a thing can be done, but we would be able to say this is like, my fifth time I've 'naded you. in CS: GO. In Korean, however, it isn't. Verbing un-doable nouns, is quite unusual in Korean. 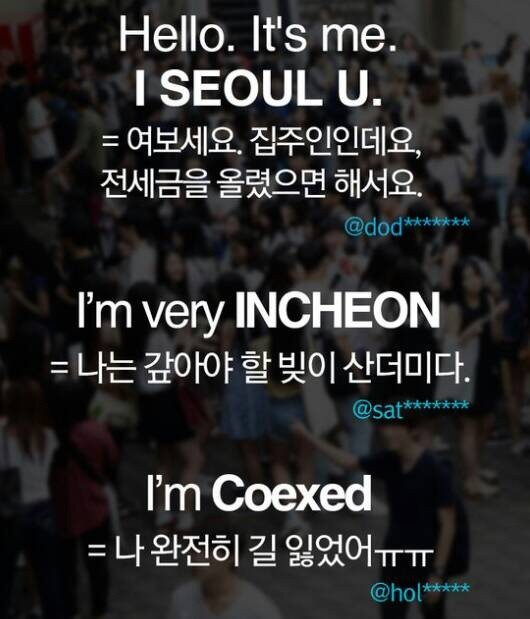 It can be barely found in some quite recent Korean slangs, since the I·SEOUL·U meme was created in 2016. Korean has only a noun equivalent (slang) of to google: 구글링 [Romanized: gugeulling]. It means, well, googling; searching on Google, not any other search engines. There's no verb equivalent of it, such as 구글하다. So the best you can do to express to google in Korean, would be 구글링 하다; to do googling. This is extremely common and natural to use. Note that, it's not a single word, so you have to space it between 구글링 (googling) and 하다 (to do). A linguistic term 영변화 (零變化, zero derivation (conversion). ): (of a word) changing the part of speech without any modification applied. 구글 검색 해 봤어? / 구글에 검색해 봤어? Did you search on google? 구글에 쳐 봐 means literally typing on Google, but it actually means searching on Google. Not the answer you're looking for? Browse other questions tagged word-choice verb or ask your own question. Are there equivalent to 때문에 with a positive/negative connotation? What are the differences in usage and meaning between 아름답다, 예쁘다, 이쁘다 and 곱다? Is there any other verb except 하다 that conjugates with 여? How to expand the verb 불러일으키시였습니다?